Fall is finally upon us and the kids have gone back to school. For those of us who have the 'empty nest' (both of my sons are in college now) it is pure delight when the kids come home to visit. Dolma was one of the first things I learned to make as a newlywed. It is very easy to prepare and very delicious. Honestly, I haven't met anyone who doesn't like a good Dolma. Here is my sure-thing recipe. 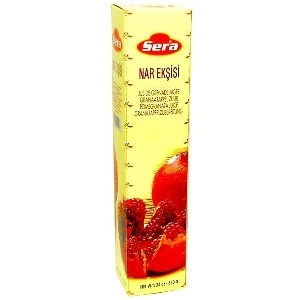 * You can find Pomegranate sour or Pomegranate Sauce in international food stores or online through Turkish foodstores. - Mix all the ingredients except the green peppers together. - Take out the stems and the seeds from the green peppers - set the stems aside to use to close the 'Dolma' after it is stuffed. - Stuff the green peppers with the meat filling. - You can leave them this way or close them with their stems or a piece of tomato on top. 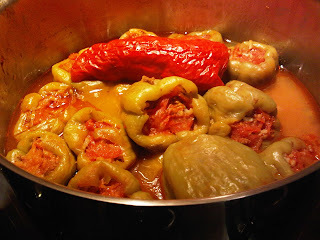 - Place the stuffed peppers in a pan standing with the open side on top. - Place a small plate over the 'Dolma' in order to prevent the filling from spilling. - Pour 1 cup of water over it. - Cook on high heat untill it boils then let it simmer for 1 hour. Serve hot with yogurt with or without garlic. Looks delicious. I must make this! My mom used to cook Dolma my entire childhood, now as a single gal, I am cooking also :D like you say, it's easy, it's delicious!